Like most women, I love shoes. Pretty shoes, comfy boots, gorgeous strappy sandals…there’s so much choice around. Clarks has been a long-time staple for the kids, but I am shoe shop agnostic and will shop whereever there is a gorgeous shoe. However, one shop that I have passed by on many occasion and not ventured into is Brantano. Unfortunately, I have mistakingly understood it to be full of cheap tat…oh how wrong was I? Brantano caters for men, women and kids. They also have lots of great brands available, ranging from Adidas trainers, rieker, Skechers and Hush Puppies to budget yet beautiful Emilio Luca X high heels. Better yet, when you shop online they offer free delivery on any spend over £20 – so that’s most shoes! I like the idea of Brantano because they keep it simple and sell shoes at a good price, on both the high street and online. They started in 1953 as a little factory shop and have now got over 145 stores across the UK, so you’re bound to be able to find one when you’re out and about (check out their stores here). I also find it refreshing how they display the shoes in pairs so it’s easy to try them on if you’re in store. If you take your kids along, the staff are trained in kids fitting too. 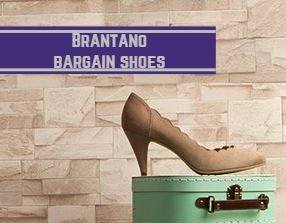 Thanks to their affordable brands (Brantano seems to be a place to go for bargain shoes), free delivery and no hassle free returns policy, the Brantano website is a great place to shop for shoes. If you’re more of an in-store person, their custom fitting expertise and the way they display shoes in pairs makes popping into one of their shops a nice experience. It’s always worth checking the website first for pricing, ideas and stock info mind.